Really Right Stuff makes the most well-built tripods on Earth are with incredible attention to detail. Everything from RRS is machined by hand to exacting specifications. The TVC 34 is my go-to tripod on all my travels. 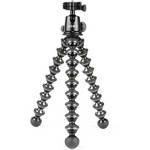 Head to Really Right Stuff to check out their extensive series of tripods. This tiny super strong table top tripod can be a lifesaver in cases where a big tripod is not allowed or difficult to manipulate. Head to Really Right Stuff to check out their series of table top tripods. Likely the best professional ball head ever made and I’ve had many other brands. What more can I say? Head to Really Right Stuff to check out their series of BH-55 tripod heads and accessories. Nice lightweight easy to manipulate ball head. Perfect for my lighter DSLR with short lenses or for the mirrorless bodies like the Fuji. Head to Really Right Stuff to check out their series of BH-40 tripod heads and accessories. This great little tripod has got me but of several jams where I wasn’t allowed to use a standard tripod. Every photographer should have one.